Need to maximize space on your desk table? Well you should choose your desk accessories carefully with detailed attention on sizes and functionality. I remember my office table in my last work which I chose personally. I've chosen a medium-size walnut table with 4 functional drawers and a side allotment space for my PC. I only placed the office phone, my desk organizer, calendar, PC monitor and small speakers. I prefer clutter-free table so every time I went home I return all my work folders on the cabinet so my table will be neat and clutter-free just like my home office table. 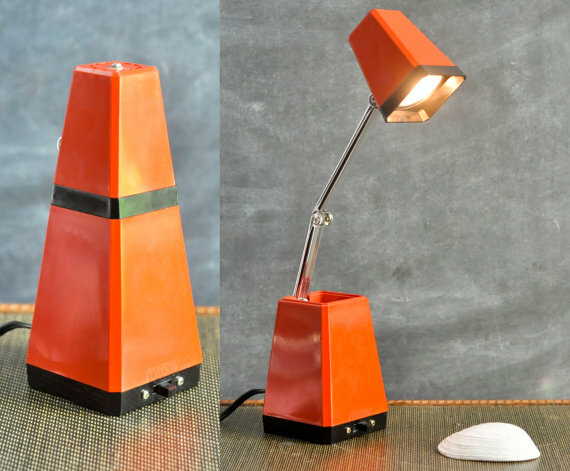 Well I found this Vintage Modern Folding Lamp Orange Expanding Multi Brightness Desk Light around 15" tall with 2 light brightness settings.